Most of the items on this website are consignment from other collectors. If you have high quality items you’d like to sell, I may have a market for them. I also occasionally buy militaria, if it’s something of interest or have a customer for it. 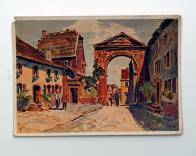 Please visit my “consignment” page for more information. A small award and promotion document grouping all named to an Unteroffizier in the Luftwaffe serving in Jagdgeschwader 5, who was shot down on June 11, 1944 shortly after the Normandie invasion. 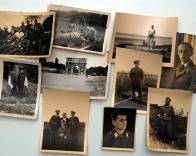 The grouping includes a Promotion document, an award certificate for the Iron Cross Second Class, and four documents pertaining to his death. This grouping originally accompanied the officers uniform tunic, which was at some point years ago was sold separately. A nicely prepared and bound booklet filled with the correspondence between two fighter pilots from opposite sides; Germany’s Erich Hartmann and America’s Frederic Arnold. The book consists of 98 photocopied pages of letters between Hartmann and Arnold (as well as various others), assorted shared documents and photos from 1986 through 1993. The book begins with the first letter to Hartmann in which Arnold is searching for information on a Me-109 pilot that he had met while a POW. 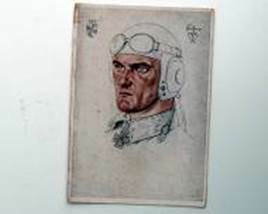 Further correspondence shows Hartmann offering assistance in research and the introduction to other German fighter pilots. A fascinating read! Nice, later war Soldbuch to an enlisted Waffen SS Panzer Grenadier, dated to December of 1944. A complete file of 29 documents from the archives of the Landesversicherungsanstalt (state insurance) for an SS member of the Polizei. All documents are carefully preserved in plastic binder pages and in very good condition. Very interesting and rare to find a grouping like this that is complete. 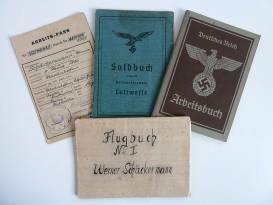 A complete grouping of identity papers for a Flieger in the Luftwaffe, to include his Soldbuch, Arbeitsbuch, Flugbuch and Arbeiter-Pass. All documents are complete, intact with no damages or missing pages. The Flugbuch has had notebook paper wrapped around the outside covers for some reason, though the book covers are both in perfect condition. Since the handwriting on the cover says “Flugbuch No. I” one has to assume there were other books and the wrapping was done for the numbering. file. It describes his personal data - name, location and date of birth, civilian profession (Engineer in this case), religion, party number, SS number, etc. and evaluation describing his character and military service. 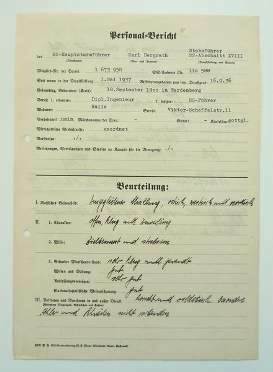 Its filled out and signed by his commanding officer SS Oberfurhrer Doring. 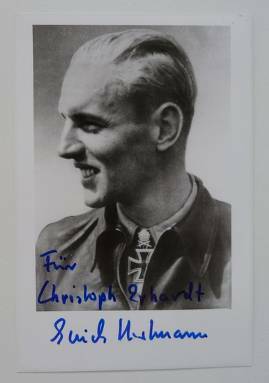 Postcard sized period photo of Luftwaffe Ace Erich Hartmann, with contemporary signature. 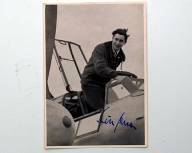 Postcard sized period photo of Luftwaffe Ace Adolf Galland, with contemporary signature. 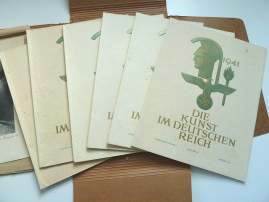 A portfolio of six “Die Kunst im Deutschen Reich” magazines dating from January through June of 1941. All magazines are Ausgabe “B” series, which feature both art and architecture in their coverage. The magazines are large format and incorporate beautiful, large photographs of German art of the time, as well as photographs of many statues, sculptures and buildings. 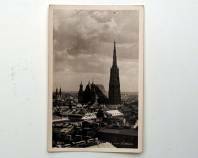 They are packaged in a brown, four panel folder and also include a matted black and white print. Over 1,000 pages of period art and photography! Signed letter (post-war) on personal stationery of Hans Ulrich Rudel, the most highly decorated German of WWII. Rudel is the only recipient of the Golden Oakleaves, Swords and Diamonds to the Knights Cross, an honor he earned flying a world record 2,530 combat missions. 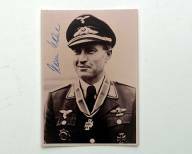 Signed photo (post-war) of Hans Ulrich Rudel, the most highly decorated German of WWII. Rudel is the only recipient of the Golden Oakleaves, Swords and Diamonds to the Knights Cross, an honor he earned flying a world record 2,530 combat missions. 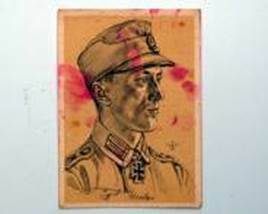 Autograph clipping from Hans Ulrich Rudel, the most highly decorated German of WWII. Rudel is the only recipient of the Golden Oakleaves, Swords and Diamonds to the Knights Cross, an honor he earned flying a world record 2,530 combat missions. 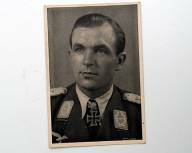 Signed photo (post-war) of Manfred Rommel, former Mayor of Stuttgart and son of Generalfeldmarschall Erwin Rommel. Signed photo (post-war) of Adolf Galland, Knights Cross with Oakleaves & Swords recipient, flying ace and Generalleutnant of the Luftwaffe. Nice, bold marker signature. Signed thank you card from Korvettenkapitan Hellmut Rathke, commander of the U-352, which was the first German submarine sunk in American waters, off Morehaed City, NC in May of 1942. This is an Original Kriegsmarine Coastal Chart of the United States showing the "Gulf of Maine" from Marthas Vineyard to the Maine/Canada border. It was in the Gulf of Maine that 2 German Agents (including American turncoat William Colepaugh) were landed in November 1944 by the German Submarine U-1230 (for mission details: http://www.uboat.net/ops/agents1944.htm) to conduct spy operations against the United States. Aside from the famous U-boat grid maps that were used solely for plotting and communicating position, a coastal chart identical to this was very likely carried on the U-1230 to help it approach the Gulf of Maine where it landed the two agents. This map is approximately 3 1/2 feet tall x 2 1/4 feet wide. The map has markings to indicate depth soundings and coastal navigation beacons. 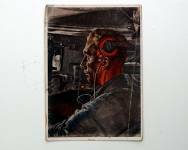 The map has ink stamps for the Kriegsmarine base at Wilhelmshaven. The map is in excellent condition and is perfect for framing and display in any collectors "war room." Oshima was the Japanese ambassador to Nazi Germany during WWII and once his diplomatic code was broken he became a major source of intelligence for the Allies. 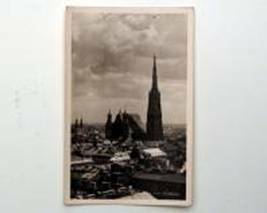 Letter is to an unknown German officer expressing thanks for the photographs sent to him following his tour of the Western Wall. Nice, wartime signature on Embassy letterhead. 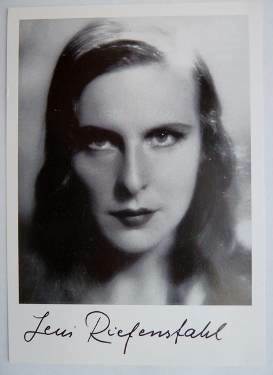 Post-war signed glossy black and white photo of famous filmmaker Leni Riefenstahl, well known for filming “Triumph of the Will”, amongst numerous other films during and after the war. Size is approximately 15cm x 10.5cm. The reverse is blank. 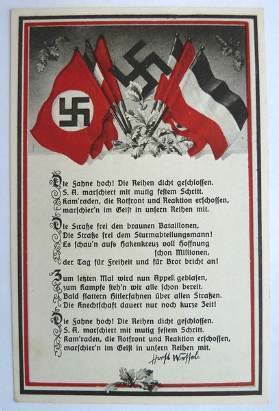 Period postcard displaying the lyrics to the Horst Wessel tribute song (“Die Fahne Hoch”). 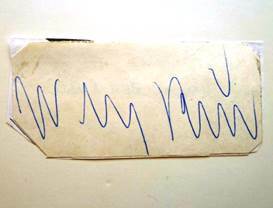 Postcard from 18 year old Polish prisoner at Auschwitz, to his parents (translation available). Letter from a Polish inmate at Dachau to his parents, from 1941 (translation available). Letter from an inmate at Auschwitz to his friend, stating that information about his health was wrong. 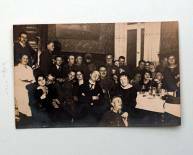 Very interesting vintage collection of wire service photos of various Japanese leaders including one of Tojo slumped in a chair immediately after he committed suicide. Click on the thumbnail photo at left for additional information. Rare, collectible First Day Cover to Captain Mitsuo Fuchida, a Japanese bomber pilot who led the first wave of attacks at Pearl Harbor. Fuchida later became an American citizen in 1960. Postwar signed First Day Cover envelope marking the anniversary of D-Day, by Luftwaffe Ace and General Adolf Galland. 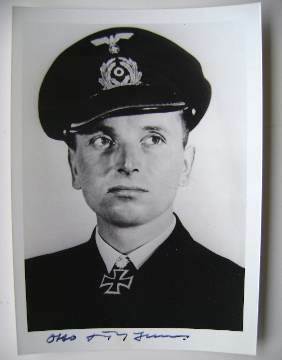 Excellent signed photograph of the successful German U-Boat Commander Otto Kretschmer, recipient of the Knights Cross with Oakleaves and Swords. Comes with a Certificate of Authenticity. Signed photograph of the successful German U-Boat Commander Otto Kretschmer, recipient of the Knights Cross with Oakleaves and Swords. Have three of these, all the same photo, each individually signed. 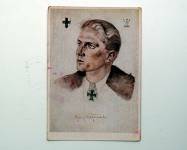 Period signed Hoffman postcard for Luftwaffe Major Walter Oesau, Commander of Jagdgeschwader 1 and one of only 28 recipients of the Spanish Cross in Gold with Diamonds. 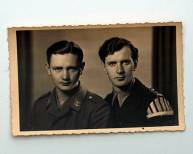 Oeasau was killed in action in May of 1944, at which time JG 1 was renamed “Oesau” in his honor. Very rare signature. KC recipient is unknown. Good research project. 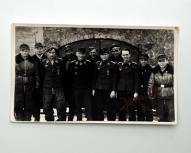 March 1945 photo of tank killer squadron, signed on back. 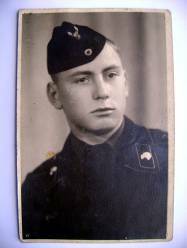 Photograph of an unknown enlisted soldier in his panzer wrap and field cap.